Before the UK referendum of June 23, 2016, China and Britain enjoyed excellent relations. President Xi Jinping and former prime minister David Cameron had initiated a new era in the bilateral relationship. A "golden era" started in October 2015 following the visit of Xi to the UK. Cameron was very enthusiastic about Sino-British cooperation on the development of the Hinkley Point C nuclear power plant, the flagship project between the two sides. Although China never interfered in British politics, it would have preferred a "Bremain" vote in the referendum. As a matter of principle it advocates continuity, supports European integration and does not want to see alterations or sudden obstacles in already opened routes. After British citizens decided for Brexit, the Sino-British partnership was affected for a few months. Cameron resigned and the new Prime Minister Theresa May was skeptical of the Hinkley Point C deal, causing some alarm in Beijing. However, she soon decided to respect Cameron's relevant pledge allowing bilateral relations to return to normalcy. Generally speaking, May is interested in developing a close relationship with China. While she is engaged in complicated Brexit negotiations, she wants to pave the way for new free trade agreements. A China-UK free trade agreement is on her agenda. Although such an agreement cannot legally come into force before the UK officially leaves the EU, some preparatory work can start. May also seeks to bring Chinese investments to her country and maintain London's reputation as a global financial center by opening new channels for trade. Here, payments in renminbi can play a catalytic role. The bilateral renminbi internationalization dialogue to take place soon in London outlines the win-win perspectives for the future. The British prime minister visited China for the first time in September 2016 on the occasion of the G20 Hangzhou Summit. At that time, only three months after the referendum, nuclear cooperation had dominated discussions with the Chinese president, although she had said that bilateral relations were "about more than Hinkley." By contrast, her recent China visit was much more fruitful. Upgraded ties between Beijing and London are expected to be part of global governance - for instance on climate change, sustainable development and fighting terrorism as the two sides agreed to embrace an enhanced version of the golden era." As far as economic cooperation is concerned, bilateral trade rose 6.2 percent to $79.03 billion in 2017. China's exports to Britain increased 1.8 percent and its imports surged 19.4 percent. In addition, British investments in China reached $1.5 billion and China's non-financial investment in Britain amounted to $1.53 billion. Those numbers might increase further this year. China's Ministry of Commerce announced that business deals worth some $13 billion were signed during May's visit. The agreements include the construction of Belt and Road initiative routes, finance, innovation, agriculture and technology. With reference to the Belt and Road initiative itself, some Western media outlets have reported that May declined to endorse it while in Beijing. But the British prime minister certainly was positive. In a press conference with her Chinese counterpart Li Keqiang, she said that her country was "a natural partner." The fact that May is keen on discussing some details with the Chinese administration does not mean she did not support the Belt and Road initiative. It should not be forgotten that the UK was represented in the Belt and Road Forum for International Cooperation last May in Beijing. Chancellor of the Exchequer Philip Hammond was there and has used the word "privilege" to describe his presence. 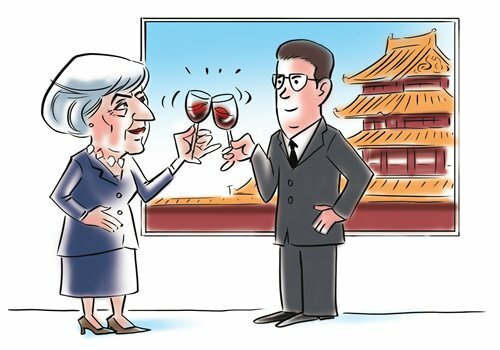 The recent visit of May to China goes beyond Sino-British relations. In a period during which she is under domestic pressure - also within her own conservative party - for her relatively soft Brexit approach, she is in desperate need of successes in other sectors such as foreign and economic policy. Advancing relations with China can not only help her international calculations, it will also serve to boost her profile in the UK.